OOOOOH! Darling! I like the one you made much better! I agree, I think the one you made is cuter. 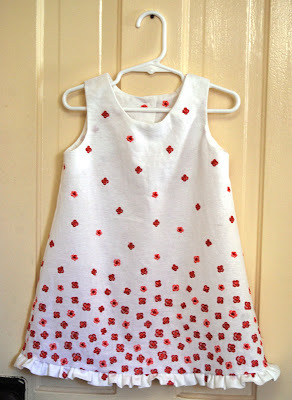 I love making clothes for my daughter using existing clothes as patterns like this. EXTREMELY cool and cute. I will be trying this dress next year for lil miss. I really like that dress. I'll definitely be using that pattern (though smaller) to make some for Rachel this next summer. She'll be adorable in them. By the way, the one you made is wonderful. Where did you get your fabric? It was on clearance at JoAnn's. I wanted to use it to make a sling, but there wasn't enough left on the bolt for that. It's a cotton/linen blend with red embroidery. very nice, you did a great job just by eye sight. This maybe way too late as this was posted over 4 years ago but I just found a link to this dress on Pinterest. I have a question about the construction. After sewing the facing to the front/back combo, how do you turn them right side out? If you've stitched around the neck and armholes, is that possible? I'm trying to picture this in my head but can't figure it out. Usually I can "see" what needs to be done but not this time. Do you have to turn it inside out through the shoulder straps? I'm a little confused as you can see. I get what you're asking--I remember having the same questions myself--but I can't quite visualize how I did it since it's been so long. 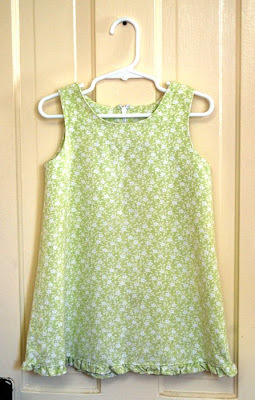 One easy option is to edge the neck & arm holes with bias binding (purchased or made from the same fabric). Just be sure to subtract the seam allowance on the neck & arm holes if you do that. Thanks for the reply. I might just have to experiment with some scrap fabric.